Why Do I Have To Clean The Beer Glasses? You pour a pint and place it on the service bar. You go back to working the wood. 90 seconds later (or sometimes, much longer), the server decides to pick up their drinks and the head on their pint has completely died. So...the server does one of two things. If nobody is watching they stir it with a straw. The Service Swirl is what we call that. If the Manager is around, they ask you to top it up. To add in an extra two-ounces of beer (about 35 cents worth). The reason this happens is that the beer is in a dirty glass. Not an unsanitized glass, but a dirty glass. The pint glass has a film of oil and grease on the inside of the glass which leads to no head retention. Stirring it with a straw or adding in free beer does not clean the glass. For that you need a special beer glass cleaning kit. But first, let’s talk about how the beer glasses get dirty. Fingerprints. Staff carrying beer glasses with “The Spider Carry” or “The Claw”. Fingerprint oil on the inside of the pint glass kills head retention. Soft Drinks. The sugar resin form soft drinks on the inside of the pint glass kills head retention. Dairy. The oils from dairy: coffee with cream/Bailey’s (I’m looking at you Opening Shift Manager), Pina Coladas,… Fats on the inside of the pint glass kills head retention. Used napkins. They fly off of the tray when we walk through the restaurant. So to avoid this, we stuff them in the pint glasses. What we don’t realize is that the fats and oils from wings, pizza, Ranch dressing,…all that “stuff” on the napkins are now inside the glass. Napkin “stuff” on the inside of the pint glass kills head retention. 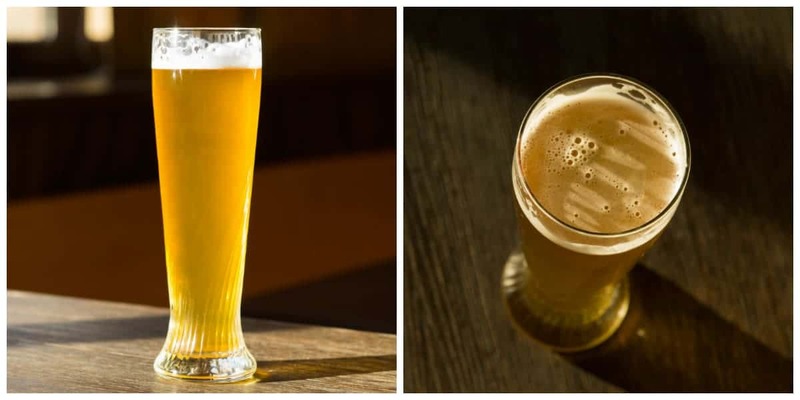 Watch a short video on the difference between a Beer Clean Glass and a Dirty Glass. 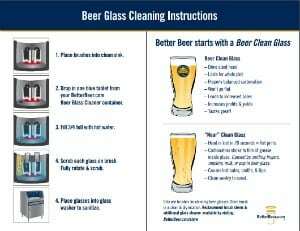 Once a week you need to use the Beer Glass Cleaning kit to scrub the oil and grease off the glass. 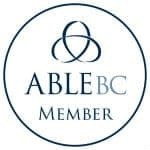 Using your glass cleaning kit each week will help keep the beer glasses Beer Clean which saves you from double handling each pint glass and also saves the bar the 35 cents in extra beer per pint. For instructions on how to clean glasses weekly, click the instructions sheet image. Don’t think that it makes a difference? Think again. Watch this short video to see how it made a difference for an entire chain of pubs. Weekly beer glass cleaning helps you save time, save money, and pour better tasting, better quality pints. Cheers to that, my friend!